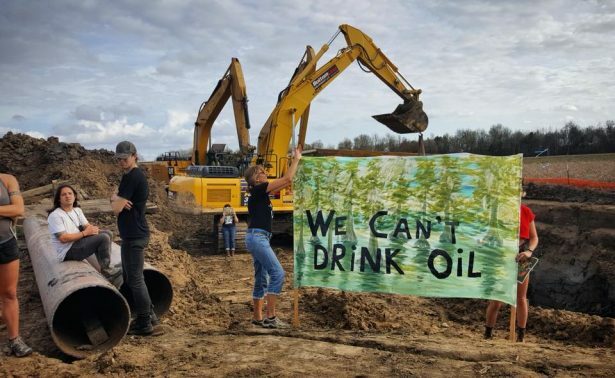 At the L’Eau Est La Vie resistance camp in Louisiana, activists are monitoring and protesting construction of the tail end of the Dakota Access pipeline. Half an hour outside of Lafayette, Louisiana — almost three hours west of New Orleans — the proposed route of the Bayou Bridge pipeline crosses the road. It’s a seemingly minor bend in the crooked path of a 162.5-mile pipeline that, if completed, would snake underground from Lake Charles near the Texas border to St. James in “Cancer Alley” — the dense stretch of refineries and other petrochemical facilities lining the Mississippi River between Baton Rouge and New Orleans. But this bend matters to Cherri Foytlin, a Diné (Navajo) and Cherokee activist, journalist and mother, whose organization owns the small plot of land around which the pipeline’s route skirts. Here, a few small structures and a long line of tents make up the L’Eau Est La Vie (“Water Is Life”) resistance camp. “We bought the land in November of last year and have been occupying it since January of this year,” Foytlin said. “The very first thing that happened is they moved their pipeline to go around the property, because it was set to go through it.” It’s a physical trace of the opposition to the pipeline’s construction, which is scheduled for completion in October. 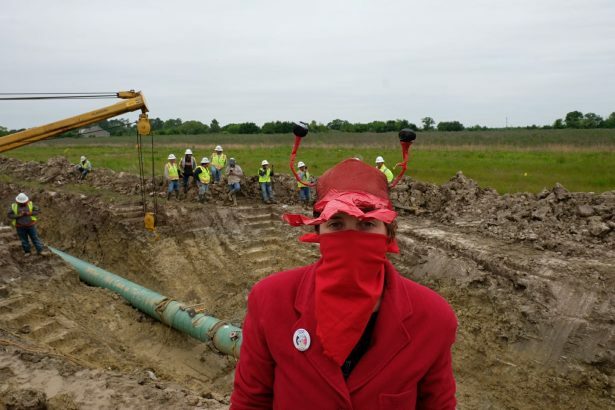 The Bayou Bridge pipeline, or BBP, is one of a handful of pipelines currently under construction by Energy Transfer Partners, or ETP, a Dallas-based oil and gas company with tens of thousands of miles of lines already operational. Further upstream from the BBP, the ETP network includes its Dakota Access pipeline, which draws sweet crude from the Bakken oil fields in North Dakota and passes through the Standing Rock Sioux Reservation on its way to Patoka, Illinois. From there, another ETP line takes the oil south to Nederland, Texas, where the first phase of the Bayou Bridge to Lake Charles has already been completed. The people and water along the line’s route are the key concern for pipeline opponents, who worry about ETP’s higher-than-average record of spills. A Greenpeace report published earlier this year found that, on average, ETP pipelines have leaked once every 11 days since 2002, releasing 3.6 million gallons of hazardous liquids, including 2.8 million gallons of crude oil. On 18 occasions, leaks contaminated groundwater. This track record worries even those whose primary fight is not against extraction, including Dean Wilson of Atchafalaya Basinkeeper — an organization committed to protecting the swamps at the 20 mile-wide mouth of the Atchafalaya River. This has led them to form coalitions with groups — including L’Eau Est La Vie — whose analysis of the situation can be very different. Basinkeeper is one of several groups, including the Louisiana Crawfish Producers Association, that sued the Corps in January for inadequate environmental review during BBP permitting. Crawfishing, a major revenue source for the basin’s population, would be devastated by an oil spill. Crawfish and other wildlife are also threatened by the sediment dredged up during pipeline construction. While a federal judge granted an injunction against the BBP in February, the Fifth Circuit Court of Appeals quickly reversed that order and allowed construction to continue while it decided on a challenge brought by ETP’s Bayou Bridge subsidiary. On July 6, a divided panel of justices ruled in favor of the pipeline. Another Basinkeeper lawsuit — filed along with local residents in the St. James Parish district court, Bold Louisiana (a group headed by Foytlin) and other organizations — targets Louisiana’s Department of Natural Resources, or DNR. In April, Judge Alvin Turner ruled against the ETP subsidiary, ordering them to develop environmental protection plans and emergency evacuation routes “prior to the continued issuance of said permit.” The ruling concerns only the final miles of pipeline that run through St. James Parish, where almost half of the population is black and nearly one in five residents live in poverty. The physical camp is now home base for a network of pipeline resisters who organize, protest and monitor construction along the BBP’s route. A rotating group lives on the land, running educational workshops and uploading photos and videos of digging and deforestation to their Facebook page and website. On May 24 and July 3 of this year, water protectors blocked access to work sites in St. James and Iberville Parishes, with multiple arrests each time. Meanwhile at camp, Foytlin has noticed a shift in local police tactics. “We have a little conversation out there, a few of us gather, and five police cars just roll up. For what? We go out to eat and come out and there’s cops out there taking our tags. For what reason?” Most recently, two mobile surveillance stations have appeared at the construction site across from the property. 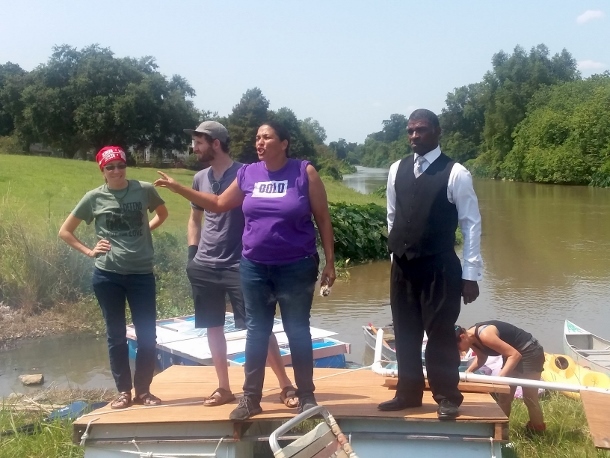 In total, the BBP’s route passes through 11 of Louisiana’s southern parishes — territory that has seen centuries of settler violence and dispossession, often in the name of resource extraction. But communities of Atakapa Ishak, Chitimacha, Choctaw and Houma people continue to live along this corridor. There are 17,000 members of the United Houma Nation, most of whom live in the Yakne Chitto, or Big Country — “technically between the Atchafalaya and Mississippi Rivers, but really between Bayou Lafourche and the Atchafalaya,” Verdin said. “There were these scattered settlements and sites where our people retreated as they were dodging the Trail of Tears.” Counting the Houma, Bayou Lafourche provides drinking water to 300,000 people along its course. The BBP would pass under it as it approaches the refinery and export terminal at St. James. Earlier in June, outside the Louisiana capitol building where dozens of protesters had just occupied the governor’s office, Alicia Cooke — an organizer with environmental justice group 350 New Orleans — explained the importance of these emergent networks. 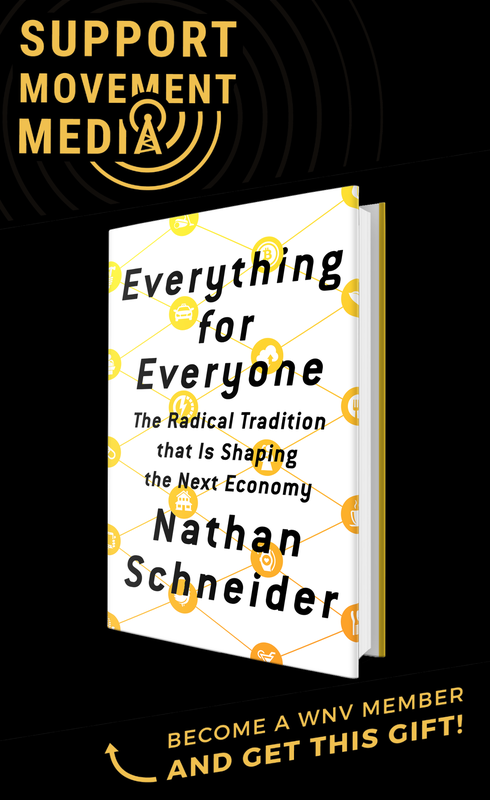 Sheehan Moore is a PhD student in anthropology at the CUNY Graduate Center in New York and an organizer with the CUNY Adjunct Project.